At the end of the blog are the Footnotes. What can the Disincarnate Gods do to you? The answer is, nothing good. Well, ok, something good — overcoming them is one of the last steps in overcoming ego. Feels a lot like dying. So when we find ourselves in the space between time and timelessness, at the Void Point, a Disincarnate God can waltz in and activate our primal fear, lust, anger, greed, pride, or sense of attachment — the stuff buried deep in our ‘lizard minds’ — which the rational mind usually keeps under lock and key. Why do Disincarnate Gods do this? Because they are jealous of our light; they can’t stand it that we are on the verge of uniting with the Light. I’d peg it as a sibling rivalry thing, on a grander scale than we’re used to dealing with. I wouldn’t bother to bring this topic up, but this issue came up again for me last night. So here is the first of five sections on Disincarnate Gods (sometimes lumped by sensitives under the general category of Disincarnate Entities. (Frankly, I think they deserve a special category of their own, because of the mischief they can accomplish). Chapter I, Item 18. 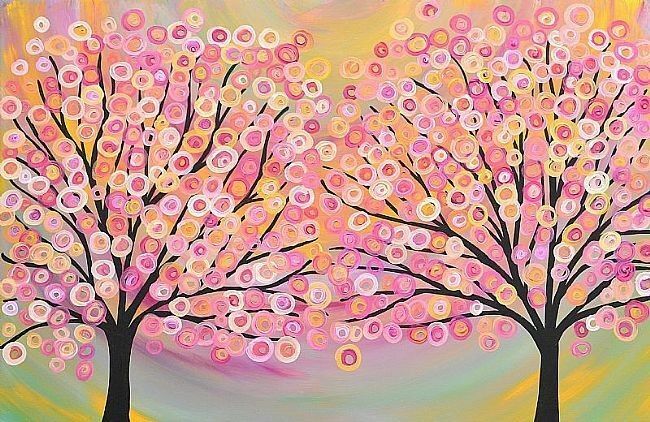 Patanjali describes a method of concentration in which one is no longer aware of objects. In other words, one attains the “I Am” state, in which one no longer relates to objects. One is one’s own hologram only, relating only to the indwelling divine awareness that is one’s Self and all that one experiences as sensory imput. This is a state beyond the causal realm of the third and fourth dimensions. One has, in essence, arrived at the fifth dimension, the ‘Kingdom of God’. Chapter I, Item 19. Here’s the hitch that the Spiritual Adept may run into: He concentrates on his own thought-waves 24 hours a day, seven days a week, but in a state of attachment. Attachment is what Patanjali calls ‘ignorance’. Ignorance leads to suffering; in this case, pretty major suffering, for the Adept will attain the great powers known to the Disincarnate Gods or else become one with the forces of Nature. ADAPTATION OF COMMENTARY FROM THE BOOK: When we attempt spiritual advancement through ‘concentration’ (as described in the book), but are still attached to the senses, liberation will not be attained. This is because attachment … such as to pleasure or power … keeps us pinned to the causal realm, the duality play. The Spiritual Adept who desires pleasure and power shall, on passing from physical form, find himself stuck in other dimensions and other forms and still in pursuit of pleasure and power. The cause of this stuckness is concentration on the sense-organs or the elements. If the Spiritual Adept concentrates on ego or mind, he will become one with the forces of Nature (I’m thinking, stuck in the Plane of Forces). As such, he will have dominion over a part of the Universe. The Commentary then describes the Hindu notion of Prakriti, or primal matter from which the mental and physical Universe evolved. Hindus think of heaven and hell as temporary states attained through karma accumulated during Earthly incarnations. The Spiritual Adept who practices concentration may desire a heavenworld experience in the afterlife. This is a far more lowly ambition that the desire for Soul liberation, union with the Atman, which is attained through yoga. ‘But thou, meek lover of the good! The gods described in this poem are bound to Prakriti because they desire power. It is they who have not practiced concentration in a detached state. There’s a description in the sacred book the Katha Upanishad of Yama, the God of Death. Speaking to Nachiketa, he describes how he made fire sacrifices in his desire to be King of Death. Alice’s comment: I could speak reams on the present-day practice of some Spiritual Adepts to offer blood sacrifice of innocents, fire sacrifice, and devotion to Lord Shiva in his destructive aspect only … with ignorance of how he clears the stage of the Duality Play for each new performance … and with rapt attention on acts of destruction for the sake of satiating subconscious sado-masochistic desires. It’s a rush, offering sacrifices of fire. But the result, in terms of Soul evolution, is severe. One may become the God of Death, and all one’s spiritual followers, in times to come, may wreak death and destruction on humankind. Yet this power to kill, fearsome as it seems, will one day end. There will come a time when each Yama … for there are more than one, it seems … must one day give up his power over life and return once more to human form. At that time he will have another chance to detach from ‘heaven’s powers’ and find union with God. Then he may attain true immortality. 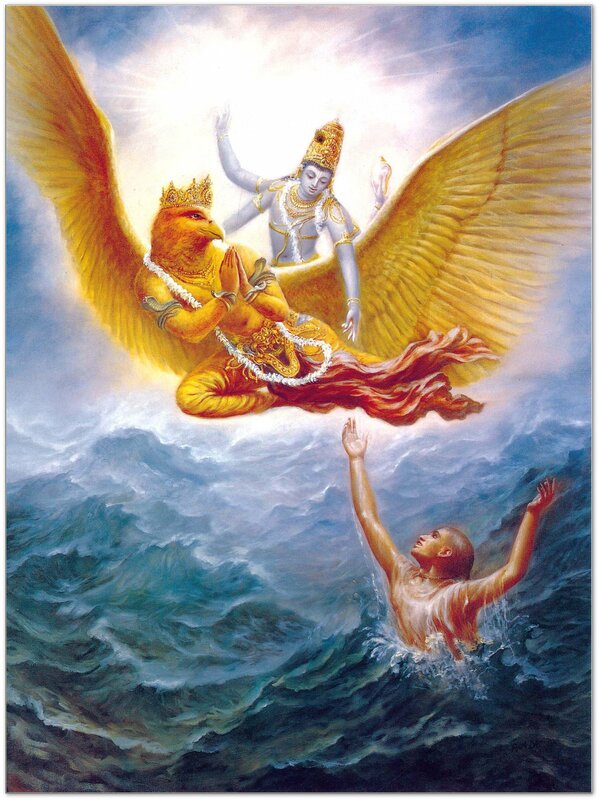 Image: Vishnu astride Lord Garuda rescues a drowning man https://theworldaccordingtochinacat.files.wordpress.com/2014/03/pyreaus_inspired_manifestation_garuda_sea_salvation_full.jpg ..
Chapter III, Item 50. When a spiritual aspirant becomes psychologically absorbed in meditation (i.e., makes ‘samyama’) on the difference between reality (purity, existence, ‘sattwa guna’) and the primordial Soul (i.e., Self, ‘Atman’), the fruits of his labors are omniscience and omnipotence. Chapter III: Powers, Item 51. These powers of omniscience and omnipotence must be renounced in order for the Soul to achieve liberation. Through this renunciation of the greatest Psychic Powers, the seed of evil is obliterated. ADAPTATION OF COMMENTARY FROM THE BOOK: What is this ‘seed of evil’? It is ignorance of the true Self. It is ignorance that makes is believe that we are a personality and an ego separate from the All. Through ignorance of the true Self, we fall into the need to satisfy our desires, and to gain power over the natural world. What power on Earth is more desirable than psychic power? And which of the many psychic powers enumerated in Patanjali’s book is more desirable than omnipotence and omniscience? Renunciation of these, the greatest of the psychic powers is to reject the supreme temptation that the ego may offer. Hard as it is to pass this test, we may take heart from Christ’s triumph over this temptation whilst fasting in the desert: Matthew 4:1-11 We too, like Christ, can be freed from the chains of personality and ego, by renouncing the psychic powers offfered us by the demon realm. Image: Temptation of Jesus in the wilderness, showing him choosing Spirit rather than earthly power: http://i2.wp.com/stjosaphat.ab.ca/wp-content/uploads/2016/01/Temptation-of-Christ.jpg?fit=559%2C293 ..
Chapter III: Powers, Item 52. Here Patanjali refers to beings that are invisible and dwell in high places. Patanjali says these beings will tempt the spiritual aspirant (i.e., ‘yogi’), and admonishes that, though this may flatter the aspirant’s ego, he must guard against it. Paying attention to these invisible beings, and allowing the ego to be so flattered, will cause the aspirant to fall once more into Soul ignorance. ADAPTATION OF COMMENTARY FROM THE BOOK: Who are these beings who are in ‘high places’? Why are they invisible? The Commentary states that they are those spiritual aspirants who have failed to renounce omnipresence and omniscience, and who then pass on. The typical course of Soul evolution after death of the physical body consists of a sojourn on the astral plane, then Soul teaching in a safely guarded and ‘cocooned’ state the mental plane, followed after the proper length of time by reincarnation. However, for spiritual aspirants who have failed this ‘ultimate test’, the situation after death of the physical body is different. These souls, on passing, become Disincarnate Gods, become one with the forces of Nature, or become Gods of Death (‘Yamas’). Alice’s Commentary: In effect, I feel, those who have failed to pass this ultimate test become ‘stuck’ in the Plane of Forces … which consists of electric, magnetic, gravitational, fohatic, pranic, and kundalini energies. They are neither in the physical plane nor in the astral plane, but stuck ‘betwixt and between’ … in a state of suspended Soul evolution, as it were. In this state, they can look up with longing at the astral heavenworlds, but they cannot attain them. And they can look down, with envy, at the spiritual aspirant who is undergoing the final test that they themselves have failed. They have the great power to kill any human on Earth, but whereas that human will in all likelihood pursue the normal course of Soul evolution after death, the Disincarnate Gods cannot. One day, ages hence, after they tire of exercising these psychic powers over the world of the living, the Disincarnate Gods will earn the right to forgo their great powers, return in a more humbled state to the world of the living, in a new incarnation as a mortal man. But for now, they suffer in a special kind of psychic superpower purgatory, a state of suspended Soul evolution. BACK TO THE ADAPTATION OF THE COMMENTARY IN THE BOOK: In this state of insufficiency, of unsatisfied and unsatisfiable desire, the Disincarnate Gods watch as others, still in physical form, attempt the ultimate test that they themselves failed. With the great psychic powers they possess, they do their utmost to drage the spiritual aspirant back into a state of Soul ignorance. Such was the case with Christ in the wilderness, and such will be the case with each of us. 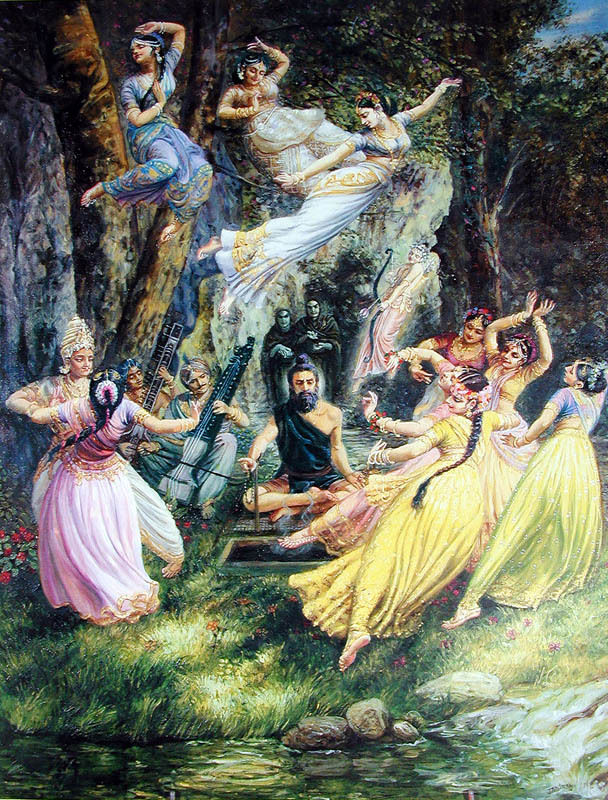 Image: “Markandeya Rishi Tempted by Cupid and His Followers” –painting by Jadurani Devi Dasi: http://www.krsna-art.com/images/pics/big/KA1_007.jpg ..
‘Kindly sit here! Do recline here! Perhaps you would take pleasure in this [morsel of food]? Perhaps you will find this lovely young woman pleasing? I have here a drink that will keep you eternally young. it will make you immortal! Here is an object that will allow you to fly! There … just over there … are magical trees. Ask of them your heart’s desire, whatever it may be. Your every wish will be granted! See that lovely mountain stream? One drink will grant you happiness. COMMENTARY IN THE BOOK, continued (this is an adaptation): Hinduism teaches that the Soul evolution of a spiritual aspirant may be interfered with by various entities, including earthbound spirits, astral entities, and the Disincarnate Gods. The spiritual aspirant can expect temptation by such beings to grow more insistent and more bold as he grows in spiritual knowledge and purity. Eventually this temptation can become quite ferocious indeed. Why is this? When the spiritual aspirant becomes adept at the mystical experience, he becomes more attractive to other human beings. His electromagnetic field becomes stronger, and this causes him to have personal charisma. He becomes aware of the unconscious minds of others, and should he will to do so, can exercise the power of mind control over them. He becomes sexually attractive to others … this is so no matter what his physical attributes may be. He may receive a steady stream of sexual offers, and how are these to be resisted, considering that his senses become much more keen, much more capable of sensual enjoyment? Especially if, in physical form, he has been considered no prize by the world at large, and he now finds himself inundated with offers of sexual liaison? How very easy would it be for the spiritual aspirant, at this stage of his evolution, to be sidetracked by desire for power and for the exercise of lustful inclinations? Thus it is that the advanced spiritual aspirant may find the greatest danger to his further evolution in his desire for worldly advancement of his own spiritual cause, and in the adoring eyes of his own spiritual students. In this way he may be alienated from pure desire to know God. According to Sri Krishna, those who seek Brahman will never end up hopelessly evil. In this we may find hope that, should we err, should we be drawn from the path of yoga, or the desire for union with God, there will nevertheless come a time when God’s light brings us once more to that path. We may hold the same hope for those who tempted us from our path. visualization of our spiritual guide, higher self, or group soul. Often spiritual people focus on the heart chakra or the third eyepoint, neglecting the very important Core Star and Navel Point energy. This energy has to do with our vital drive, our will power. This often overlooked energy must be very strong in us if we are to overcome the Disincarnate Gods. Image: Surrendering to the Light: https://reachingforsoul.files.wordpress.com/2012/07/surrendering-to-the-light.jpeg ..
Overcoming ego is about absolute faith and total surrender. Not a popular topic with Westerners, but there you have it. For the aspirant to the highest Light, this is what it’s all about. In order to surrender our ego, we need to have faith. Faith in a higher power. It could be a guru or saint. It could be our own Higher Self. It could be faith in Om. Our path to faith, the way we attain it, is not important. What’s important is that we have it. Why? Faith is the supreme antidote to fear, and fear such as you have never conceived possible is what a Disincarnate God can manage to access in our psyches. What if faith is not your strong suit? In that case, you might wish to try daily affirmations to that effect … for instance, each day, on arising, you can affirm: ‘I have faith. I have faith in God. I have faith in his plan on Earth. I have faith in myself as His loving and dearly beloved child. And I have faith in all creation, and in every human being. Faith makes surrender (or ‘letting go’) possible. So, have faith, dear ones! Be of good cheer! All is well! Image: Lord Shiva turning Kamadeva (Cupid, god of love) to ashes: http://cdn.detechter.com/wp-content/uploads/2016/03/197944_159650527425094_100526190004195_370094_3595663_n_thumb.jpg ..
See … Link: “Protection Against Just About Every Dark Thing,” compiled by Alice B. Clagett, http://wp.me/p2Rkym-5bA ..
May this being find its true home and true happiness. May it be dissolved in the highest light. This is quite similar to dissolving a being in light. For details, see Link: “Mental, Physical and Emotional Control: The Technique of Engulfing with Love,” by Alice B. Clagett, http://wp.me/p2Rkym-1y ..
Disincarnate Beings find the colors rose and gold particularly odious. Also excellent as a Disincarnate-Being deterrent: pink, yellow, and orange. As to why these are their hated colors? I don’t know, but I am sure of the fact that they find them repellent. So, surround yourself with rose and gold! You can simply visualize these colors in your mind, or sing a little song about them (‘I love rose and gold!’). You can wear these colors, either as clothes or as jewelry, go to the dollar store and find a few rose or gold things to put around your house, or make a game of picking out these colors as you go about your day. 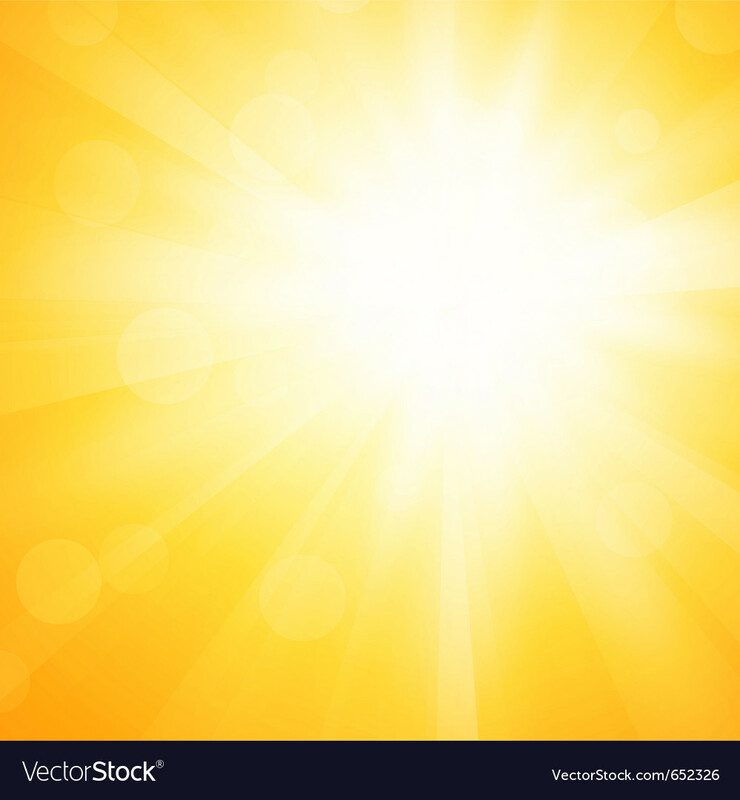 Image: Golden sun: https://cdn.vectorstock.com/i/composite/23,26/yellow-sun-background-vector-652326.jpg .. The gold color of the sun is my favorite — once as I was walking, I faced toward the sun; my heart opened and seemed to drink in the energy of the sun. Love at first sight! At night I notice the gold color of headlights outdoors and electric lights indoors. There is no question in my mind as to the power of this technique. There are many possibilities. Who we visualize is a question of personal preference. Among the pictures below, you may find one to which you’re drawn. Or you may have another preference. Here is a beautiful illustration of Om: Image: Om, https://iamofthestars.files.wordpress.com/2016/05/bc42d-om-healing-japan-march-2011.jpg ..
Well, dear ones, these are the tools in my Disincarnate God war chest at the moment. May they be of service to you if the need arises! Several years ago Bill Ballard (see the blog category Ascension Resourcdes) offered informatio regarding Team Dark. He said that they are Ascended Masters who are other parts of us. They are still in their unawakened state, and are pushing the game of duality to its limits in an equal balance so as to balance light and dark, as the light quotient of all humanity increases. To offer my own tweak on this thought: Team Dark, who are what you might call the ‘lower rung’ of Ascended Masters — what I’ve described as ‘Disincarnate Gods’ above — might be considered, possibly, not our arch enemies. But rather, we could think of them as Ascended Masters — for instance, former Spiritual Adepts and/or respected teachers of spirituality on Earth — who have passed on in a not perfectly enlightened state — and who could benefit from, and might actually be looking forward to, an increase in their Light Quotient. So, from that perspective, it might be more useful to think of them as Novice Ascended Masters. Considering the long way they have come towards self-mastery, as evidence by their psychic powers, they may, in fact, think quite highly of themselves .. in the same way that we might feel pleased with our own spiritual progress, not knowing the long path that lies before us, nor the depth and power of the eternal spark that is our true Self. For the Novice Ascended Masters, as for us, the increasing intensity of light on Earth may be causing ‘spinoff’ of karmic impurities (that is to say, morphogenetic field distortions). This may manifest to us as acts of mind control and senseless violence in the world around us. But this is not the time to harden our hearts against them. Keep in mind that, from their perspective, the phenomenal world is but a moving picture show. Apparently this is literally true of the Ascended Masters -– they see the world events we take so seriously as a fascinating fiction, lacking the qualities of the true light of Creation. And so, if someone dies or suffers by their hand, this act has not the same depth of meaning to them as it does to us, who may find ourselves sitting a little ‘too close to the screen.’ Consequently, this cinematic action fills our visual field and occupies our minds with issues of right and wrong, instead of with the bigger picture of karmic disentanglement to which they are privy. Given all this, the fact of the matter is that being on the receiving end of the Novice Ascended Masters’ attempts at karmic disentanglement is no fun whatsoever. Along those lines, I’ve found this prayer on their behalf to be very helpful in my own life. Perhaps it may be of use to you as well? Be far, far, far from me. May they be completely forgiven for all wrongs done. May the good people they harmed be healed. And the grace of the Elohim. Until now, Novice Ascended Masters have been considered by normal humans to be ‘omnipresent’ and ‘omnipotent’ (see section (2), How to Steer Clear of the Disincarnate Gods, above), although in actuality these latent abilities of theirs are often curtailed and channeled into ‘dead ends’ of negative affect by distortions in their morphogenetic fields. As is the case with most of humanity, who are in the throes of co-creating a ‘local’ (global – and in a few cases, galactic) field of ‘omnipresence’ and ‘omnipotence’. Which is to say, greater co-creative power in these domains than we have hitherto exercised. Folks are sometimes put off when they encounter the Disincarnate Gods, because of all their ‘superpowers’… but let’s think about this for a moment. The Disincarnate Gods are just human beings who have allied with the powers of Nature, and on their passing have retained those psychic powers acquired during their lifetime, and especially the powers of omnipotence and omniscience. I realize these latter two powers are a little daunting…. At least, I’ve found it so. However, one power the Disincarnate Gods don’t have is power over time. They exist within one timeline only, whichsomever might disconcertingly be the timeline we find ourselves in at the moment. But now, with the Shift, timelines are winding up. Spirit tells me now is the time when the Disincarnate Gods are are winding up their ‘in-between’ state and turning to the Light. As mentioned above, one way of thinking of the Disincarnate Gods is to imagine that they are on their Soul’s journey towards being an Ascended Master. Thus, they might better be termed ‘Novice Ascended Masters’. As such, they’re now at the stage of learning about the Plane of Forces, which lies between the physical plane and the astral plane. The Plane of Forces is the playground of those fearsome beings, the jinn and the ifrits, which dwell in Earth’s deserts, unbeknownst to modern man, but well known to King David and through the myths of Ancient Araby. It might help to think of those Souls that are ‘caught between this world and the next’ as little children who have lost their way. If they have been ‘in-between’ for a while, they are most likely a little confused about where they are and what is going on. This is true not only of the Disincarnate Gods, but also of our ancestors and all ghosts that have not passed into the Light yet. (1) Adapted from Chapter I: Yoga and Its Aims, items 18 and 19 (along with relevant Commentary) in Link: “How to Know God: The Yoga Aphorisms of Patanjali,” translated with a commentary by Swami Prabhavananda and Christopher Isherwood, available from http://www.scribd.com/doc/9268274/Yoga-Aphorisms-of-Patanjali-translation-and-commentary-by-Swami-Prabhavananda-and-Christopher-Isherwood or www.amazon.com ..
(2) This poem is in the public domain; see http://www.poetic-love.com/publicdomainpoetry/poetry.php?pdid=15301 ..
(3) Adapted from Link: “How to Know God: The Yoga Aphorisms of Patanjali,” translated with a commentary by Swami Prabhavananda and Christopher Isherwood, Chapter III: Powers, items 50-52 (along with relevant Commentary) … See pp 128-132 at http://www.scribd.com/doc/9268274/Yoga-Aphorisms-of-Patanjali-translation-and-commentary-by-Swami-Prabhavananda-and-Christopher-Isherwood … Or see pp 194-198, in the 1981 edition published by the Vedanta Society of Southern California, available at www.amazon.com ..
(4) Link: “Shikra trap – a Bal-chatri with Bird Bait,” from Macpherson HA (1897). A history of fowling. Edinburgh: David Douglas. … author H A Macpherson … from https://commons.wikimedia.org/wiki/File:ShikraTrap.jpg … public domain. (5) Symbol for the solar plexus chakra. Manipura means “the place of the shining gem.” by Morgan Phoenix … from https://commons.wikimedia.org/wiki/File:Manipura_Mandala.svg … Creative Commons Attribution-Share Alike 3.0 Unported license. This entry was posted in A - My Favorites, Ascended masters - saints, Disincarnate gods - omnipresence, Expiation - scapegoating - blood sacrifice (see also 'Pariah - outcast - shunning'), Faith - despair - hope - trust, Ghosts - kama rupa, Hinduism, Letting go - surrender - rewriting history - the Now, Meditations - visualizations, Neo-Hinduism - Neo-Vedanta, Patanjali - Swamij, Plane of Forces: electricity - gravity - magnetism - fohat - prana - kundalini, Protection - sanctuary, Psychic powers and tagged Ancestors, Ascended Masters, Ascension, astral planes, blood sacrifice, Disincarnate gods - omnipresence, Divine Light, faith, grace light, gracelight, Hinduism, lost children of the soul, neo-Hinduism, Neo-Vedanta, omnipotence, omnipresence, omniscience, Patanjali, Plane of Forces, protection, Sri Aurobindo, surrender, Vallalar, visualization, will power, wounded body elementals on 12 May 2016 by Alice B. Clagett.